Low back pain is one of the most common types of chronic pain in the United States, and though the problem often stems from physical activity or muscle strain, learning a few appropriate exercises can help with back pain management. Back pain can discourage us from staying active, but physical activity is an important part of avoiding pain because it helps us maintain flexibility, strength and endurance. Gentle exercises can help you strengthen your stomach, back and leg muscles to make them less vulnerable to injury and provide better support for your spine. Some people who suffer from low back pain find that they feel better when sitting, while others feel better while standing or lying down. The best ways to exercise will be those that keep you in the most comfortable position. Knee-to-chest stretches. Lie down with your feet flat on the floor and knees bent. You can cushion your head with a pillow if desired. Bring one knee to your chest at a time and hold each one there for 15 to 30 seconds. Repeat the activity two to four times with 30-second breaks between. Piriformis stretches. Lie down with your feet flat on the floor and knees bent. Cushion your head with a pillow if desired. Bring your left leg across your right, resting your left ankle on top of your right knee. Hold your left knee with both hands and pull it towards your right shoulder gently. Hold the position for 15 to 30 seconds, then do the same with the opposite leg and repeat the whole process two to four times. Standing back bends. Stand straight up with your feet positioned directly beneath your hips. Place your palms on your waist with your fingers against your lower back and avoid locking your knees. While keeping your legs and neck straight, lengthen your spine up through the top of your head and bend back gently over your hands. Repeat three to 10 times. Press-ups. Lie on your stomach with your forearms flat on the floor, palms down. Raise your upper back by pushing down with your elbows and relax your abdominal muscles to let your back arch gently. Keep your pelvis and hips on the floor. Hold the position for 15 to 30 seconds, relax and repeat two to four times. Many people with back pain can also help themselves recover and maintain better health with regular aerobic exercise. Try to do a gentle aerobic exercise like walking or swimming once each day. Staying active can help you improve low back pain and prevent this common form of chronic pain from returning. 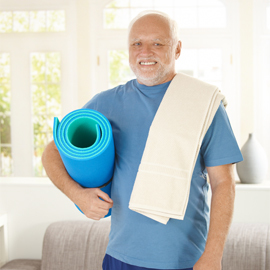 If you have any questions about exercising with low back pain, speak with Dr. Kerendian.